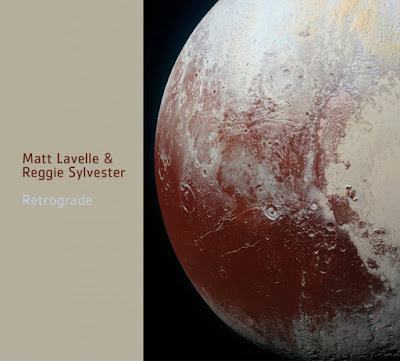 Matt Lavelle and Reggie Sylvester, New York avant-jazz scene veterans and longtime cohorts in the Bern Nix Quartet, perform in duo here on an audacious extension of Interstellar Space, John Coltrane's classic duo album with drummer Rashied Ali. Visiting destinations overlooked on Trane's tour of the solar system, they craft a space suite of earthier delights. This album was recorded in concert at Andrea Wolper's WhyNot Experiment? series -- it was, in fact, the last show in that series. Matt and Reggie played two sets; the second set, with Bern Nix in the audience, is what you hear on this album, which is dedicated to the late Mr. Nix. This is the fifth album as a leader from multi-instrumentalist Matt Lavelle (b. 1970), and his first on ESP-Disk'. He studied with avant-jazz icon Ornette Coleman and swing-era veteran Hildred Humphries (Count Basie, Billie Holiday), has worked with William Parker, Bern Nix, Roy Campbell, Daniel Carter, Jemeel Moondoc, Mat Maneri, Matana Roberts, Rashied Bakr, and folk/American improv ensemble Stars Like Fleas, etc. He collaborated with ESP fave Giuseppi Logan on the latter's late-in-life comeback and was in three of Sabir Mateen's bands for a total of ten years. Lavelle leads a variety of groups, most notably The 12 Houses, an all-star avant big band. Also a writer, he has had academic work published, has the music blog nosoundleftbehind, and penned Retrograde's liner notes. Drummer Reggie Sylvester (b. 1957) was a member of the early Black Rock Coalition of the mid-1980s and played in the BRC Orchestra. In For/Against Babylon he opened for Blues Traveller, Spin Doctors, Bill Laswell, and Raging Slab at Wetlands. In 1995, he recorded with experimental guitarist/vibist/bassist Paul Steven Ray; the three-song EP was produced by John Snyder. In 2001 Sylvester joined metal/hard rock power trio Rock deisel, which recorded the independent CD Feedback. In April 2012, he became a member of the Bern Nix Quartet, playing all their shows until Nix's death in 2017 and on their 2013 album Negative Capability. Sylvester co-leads avant-pop/folk group Human Hearts Trio with singer-songwriter Lindsey Wilson, a band that has sometimes included multi-instrumentalist Daniel Carter. Sylvester was commissioned by Patricia Nicholson Parker to compose and perform I Know Your Face with Wilson, Carter, Nix, and bassist Francois Grillot at the Arts for Art festival Justice Is Compassion. Sylvester has also performed with Charles Gayle, Jemeel Moondoc, James Brandon Lewis, Ava Mendoza, On Ka Davis, J.D. Parran, poetess Ann Waldman, Tulivu Donna Cumberbatch, and Charles Waters. A few words about James McLean as well. Long the soundman at the original Knitting Factory, he did the on-location recording for this album and then carefully engineered a full sound as good as that of a studio album.